Wall Street loves Donald Trump's pledge to slash taxes, roll back regulation and unleash infrastructure spending. But investors fear that his anti-trade campaign talk could translate into damaging protectionist policies. Trump's stance on trade is easily the market's No. 1 concern about the incoming administration, according to a CNNMoney survey of market strategists. All but one of the 15 experts who responded to a question about which Trump campaign promises they found most alarming cited potential obstacles to free trade. "More stringent trade barriers would disrupt global supply chains, slow manufacturing across the globe and potentially launch trade wars," said Terry Sandven, chief equity strategist at U.S. Bank Wealth Management. Still, stock pickers are mostly upbeat about the markets. Strategists polled by CNNMoney on average expect the S&P 500 to rise 5% by the end of next year, modestly adding onto a powerful post-election surge on Wall Street. But there is worry that the Trump rally could be derailed if the new administration embraces protectionism -- a shift that could have profound consequences. "Trade-limiting policies could hit consumers hard with additional economic damage from knock-on effects such as higher inflation and job destruction," said Brad McMillan, chief investment officer for Commonwealth Financial Network. Could tariffs spark trade war? During the campaign, Trump blamed trade deals for shipping jobs overseas. 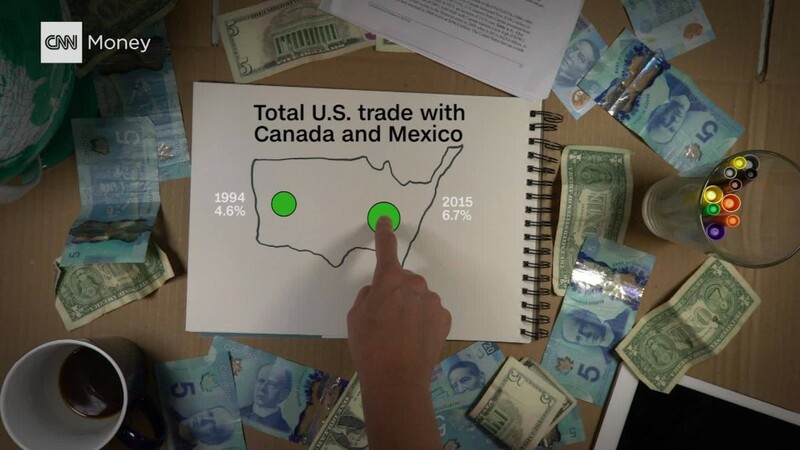 Trump has talked about leveling the playing field by installing tariffs on U.S. imports or even by ripping up NAFTA, the trade deal between the U.S., Mexico and Canada. Now that he's president-elect, Trump's team is considering a 10% across-the-board tariff on all imports from all countries, sources told CNN. Russ Koesterich, head of asset allocation for BlackRock's Global Allocation Fund, said he's concerned about the "potential for a trade war." The fear is that if Trump follows through on a threat to install a 35% tariff on Mexico or companies that move jobs there, other countries will retaliate and a trade war could break out. Another tool Trump could resort to: a border adjustment tax. The BAT would make it more expensive for U.S. firms to import goods and less expensive to export by giving companies a tax adjustment. The hope is that such a move would cause the U.S. dollar to rise, offsetting a potential increase in consumer prices. Phil Blancato, CEO of Ladenburg Thalmann Asset Management, said he's "alarmed" by Trump proposals that seem to be "anti-growth," such as anti-trade policies. Of course, Trump may just be using the threat of tariffs and pulling out of NAFTA as negotiating tactics. "The tariff is not an end game, it's a strategy -- a strategy to renegotiate trade deals," Peter Navarro, the economist tapped to lead Trump's newly created White House Trade Council, told CNNMoney earlier this year. Trade isn't the only Trump campaign proposal that concerns market strategists surveyed by CNNMoney. Several also cited Trump's threat to deport up to 11 million illegal immigrants. Such a move could be very disruptive to companies that rely on immigrants for workers. "An immigration restriction on the already tight labor market and aging population can hurt economic growth and create heated wage inflation, which can also hurt corporate profits," said Blancato. For now, the market is clearly more focused on Trump's pro-growth proposals than his more destabilizing ones. The Dow has skyrocketed nearly 1,600 points since Trump's victory, confounding those who predicted a crash if he won. Asked which campaign promise they are most encouraged by, almost every strategist surveyed by CNNMoney cited Trump's pledge to slash taxes as a way to create more jobs. "The biggest positive is tax reform," said J.J. Kinahan, chief market strategist at TD Ameritrade. Kinahan said the "most exciting" thing would be cutting tax rates, but he's also encouraged by plans to allow companies to "bring back the vast amount of cash they have sitting overseas." One potential problem for the next six months is that optimism over Trump's stimulus plans have sent stocks soaring so high that most market strategists said U.S. valuations are either "extended" or downright "expensive." "Stocks are fully priced or overvalued if based on existing policy," said David Kotok, chief investment officer at Cumberland Advisors. Wall Street is banking on "rapid adoption of the Trump agenda," he said. "Any disappointment can lead to a stock price correction."